Pioneers in the industry, we offer 5 l spout packing pouch, spout packaging pouch and 500 ml spout packing pouch from India. 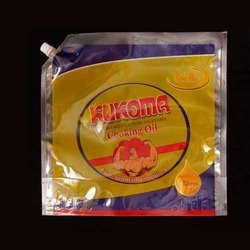 With the constant support of our highly skilled team, we are engaged in offering high-quality 5 L Spout Packing Pouch. Offered spout packing is provided in numerous sizes as per the market needs. This spout packing is manufactured utilizing contemporary machines and prime grade material. Additionally, the entire range of spout packing is checked upon a series of parameters for supplying a flawless range. We offer Spout Packaging Pouch which are being manufactured with using our State of the art technology & are suitable for packing Photo Sensitive Toner. Strongly committed to quality, our range of products are fabricated from fine quality material that imparts required durability and strength to the pouches. The array of six sides sealed pouches can be availed in multi-colored printings. Further, it can be customized to suit the exact requirement of the customer. 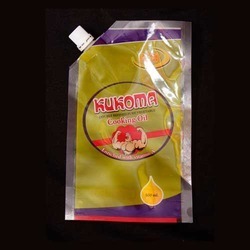 We bring forth for our prestigious clients fine quality 500 ml Spout Packing Pouch. Our offered spout packing is checked at our end so as to deliver a flawless range. This spout packing can also be customized by our workforce as per the market need. Offered spout packing is manufactured by using quality approved material and advanced techniques.